There are some Blackjack games that to be fair, can be quite complicated to play, however one game that certainly isn’t is the Vegas Single Deck Blackjack game that you will find on offer at all casino sites online that carry the impressive range of WGS designed games. As the name of the Blackjack game variant does suggest there is just the one single deck of 52 playing cards in the shoe, and for reference the entire deck is shuffled at the end of each game played, so you will always get a fair and random outcome when playing it! The house edge of the Vegas Single Deck Blackjack game has been certified and this WGS game has also been independently tested and verified as being a completely random game too so you will always get a range and fair outcome when playing it. 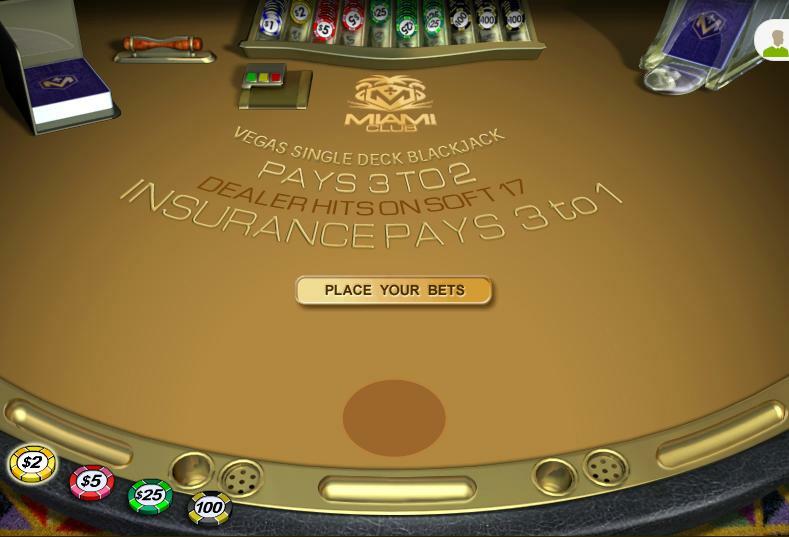 If you play the Vegas Single Deck Blackjack game there are going to be no bonus bets or any type of bonus games or bonus features that you can trigger, for this is a casino card game and as such it is the outcome of the game when your hand is compared to the dealers hand is the one that determines the outcome of each game played. You are however going to be offered an Insurance side bet when playing Vegas Single Deck Blackjack, and that is going to be offered to you if the Dealer has been dealt out an Ace as his up facing card, and therefore the is a chance that he will be dealt out a Blackjack hand. When playing the Vegas Single Deck Blackjack game and you are offered the insurance bet that bet will cost you half of the amount you wagered on the base hand if you want to take that side bet option, if the Dealer does then have a blackjack hand your side insurance bet will pay out at odds of 2 to 1. Vegas Single Deck Blackjack does have two base game winning payouts, all winning players Blackjack hands payout at odds of 3 to 2 and all other winning players hands pay out at odds of even money. If your hand and the Dealers match when playing the Vegas Single Deck Blackjack game then that game is a push and you will receive your stake money on each hand you placed a bet on that matched the Dealers hand back and that is known as a push. If you have been looking around at several of our different blackjack game variant reviews and articles then one thing you will have noticed us mention in quite a number of them is that you should always play with the best strategy for the blackjack game variant you have chosen to play. Whilst you can of course play for free to get to grips with playing any online or mobile blackjack game what you are always strongly advised to do is to also look up the blackjack strategy card for the variant you are playing and follow it when paying so you never make any playing errors! When you play Blackjack in a land based casino you can often be intimidated by the other players sat around the tables, and as such if you want to play on your own and from the comfort of your own home and want to be able to play at your own pace too then make sure you give the fun to play and often high paying Vegas Single Deck Blackjack game a try!